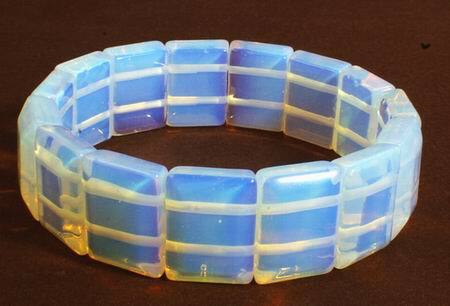 Sorry, we are currently sold out of 'Enchanting Moonstone Rectangle Bracelet'. Please check back later. Price is per bracelet. Measures 2.5-inches closed, but expands to fit all. Size of each bead is 18mm x 13mm x 7mm. Moonstone is translucent, and softens the light shining through it to give a pearly moon-like glow. This distinctive shimmering affect called adularescence, is caused by the way the stone reflects light. Moonstone comes in colorless, white, grey, and subtle yellow or peach, but always has a blue or white sheen. Rainbow moonstone is colorless with a blue sheen and a rainbow-like array of colors – a very attractive semi-precious stone. Moonstone is thought to grow stronger or weaker with the moons cycle. During full-moon it’s a very powerful stone for the reconciling of love, and as the moon decreases, is said to allow person to foretell the future. In India it’s sacred for lovers. A feminine stone for the inner-child, female issues and nurturing - but also used by men who want to reach their female side and to understand dreams. Moonstone brings confidence and calms the emotions, easing an understanding of spirituality, intuition, and clairvoyance. Also known to protect against fever, dropsy, fluid-retention and urinary problems. Moonstone is especially protective to seafarers, who have been using it since ancient times. Opalite moonstone is most common today. This is a synthetic stone looking similar to genuine moonstone, that's only been around recently. Against a light background, it appears milky white, shimmering golden faint lilac-blue and other colors. Against a darker background, it changes to a bright icy blue with the highlights altering to intense oranges and reds. The stone practically glows on its own, and demands attention by outshining all around. Opalite moonstone adds a romantic feminine allure to your jewelry, always looking refreshingly cool - ideal for summer. Its pastel glow is soft and captivating, complimenting other light-colored stones like lilac amethyst, blue chalcedony, and rose quartz. It also loves to compete with wild bright colors like reds and turquoise. This flamboyance makes opalite ideal to wear during a night out on the town.